Can changing how prosecutors do their work improve public safety? In the 1990s, policing in major US cities was transformed. Some cities embraced the strategy of “community policing” under which officers developed working relationships with members of their local communities on the belief that doing so would change the neighborhood conditions that give rise to crime. Other cities pursued a strategy of “order maintenance” in which officers strictly enforced minor offenses on the theory that restoring public order would avert more serious crimes. Numerous scholars have examined and debated the efficacy of these approaches. A companion concept, called “community prosecution,” seeks to transform the work of local district attorneys in ways analogous to how community policing changed the work of big-city cops. Prosecutors in numerous jurisdictions have embraced the strategy. Indeed, Attorney General Eric Holder was an early adopter of the strategy when he was US Attorney for the District of Columbia in the mid-1990s. Yet, community prosecution has not received the level of public attention or academic scrutiny that community policing has. A possible reason for community prosecution’s lower profile is the difficulty of defining it. Community prosecution contrasts with the traditional model of a local prosecutor, which is sometimes called the “case processor” approach. In the traditional model, police provide a continuous flow of cases to the prosecutor, and she prioritizes some cases for prosecution and declines others. The prosecutor secures guilty pleas in most of the pursued cases, often through plea bargains, and trials are rare. The signature feature of the traditional prosecutor’s work is quickly resolving or processing a large volume of cases. Community prosecution breaks with the traditional paradigm and changes the work of prosecutors in several ways. It removes prosecutors from the central courthouse and relocates them to a small office in a neighborhood, often in a retail storefront. This permits the prosecutor to develop relationships with community groups and individual residents, even allowing residents to walk into the prosecutor’s office and express concerns. It frees the prosecutors from responsibility for managing the flow of cases supplied by police and allows them to undertake two main tasks. The first is that prosecutors partner with community members to identify the sources of crime within the neighborhood and formulate solutions that will prevent crime before it occurs. The second is that when community prosecutors seek to impose criminal punishments, they develop their own cases rather than rely on those presented by police, and they typically focus on the cases they anticipate will have the greatest positive impact on the local community. In the past fifteen years, Chicago, Illinois, has had a unique experience with community prosecution that allowed the first examination of its impact on crime rates. The State’s Attorney in Cook County (in which Chicago is located), opened four community prosecution offices between 1998 and 2000. Each of these offices had responsibility for applying the community prosecution approach to a target neighborhood in Chicago, and collectively, about 38% of Chicago’s population resided in a target neighborhood. Other parts of the city received no community prosecution intervention. The efforts continued until early 2007, when a budget crisis compelled the closure of these offices and the cessation of the county’s community prosecution program. For more than two years, Chicago had no community prosecution program. In 2009, a new State’s Attorney re-launched the program, and during the next three years, the four community prosecution offices were re-opened. 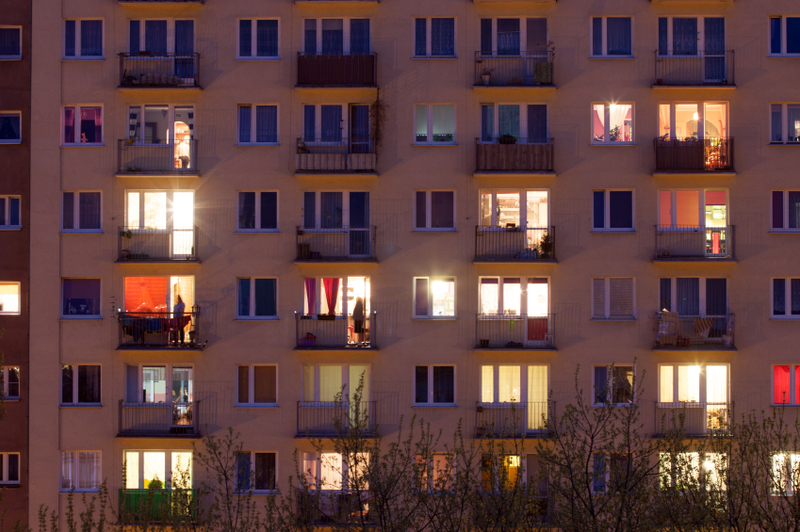 Window of an apartment block at night. © bartosz_zakrzewski via iStockphoto. This sequence of events provided an opportunity to evaluate the impact of community prosecution on crime. The first adoption of community prosecution in the late 1990s lent itself to differences-in-differences estimation. The application of community prosecution to four sets of neighborhoods, each beginning at four different dates, enabled comparisons of crime rates before and after the program’s implementation within those neighborhoods. The fact that other neighborhoods received no intervention permitted these comparisons to drawn relative to the crime rates in a control group. Furthermore, Chicago’s singular experience with community prosecution – its launch, cancellation, and re-launch – furnished a sequence of three policy transitions (off to on, on to off again, and off again to on again). By contrast, the typical policy analysis observes only one policy transition (commonly from off to on). These multiple rounds of program application enhanced the opportunity to detect whether community prosecution affected public safety. The estimates from this differences-in-differences approach showed that community prosecution reduced crime in Chicago. The declines in violent crime were large and statistically significant. For example, the estimates imply that aggravated assaults fell by 7% following the activation of community prosecution in a neighborhood. The estimates for property crime also showed declines, but they were too imprecisely estimated to permit firm statistical inferences. These results are the first evidence that community prosecution can produce reductions in crime and that the reductions are sizable. Moreover, there was no indication that community prosecution simply displaced crime, moving it from one neighborhood to another. Neighborhoods just over the border of each community prosecution target area experienced no change in their average rates of crime. The declines thus appeared to reflect a true reduction instead of a reallocation of crime. In addition, the drops in offending were immediate and sustained. One might expect responses in crime rates would arrive slowly and gain momentum over time as prosecutors’ relationships with the community grew. But the estimates instead suggest that community prosecutors were able to identify and exploit immediately opportunities to improve public safety. This evaluation of the community prosecution in Chicago offers broad lessons about the role of prosecutors. As with any empirical study, some caveats apply. The highly decentralized and flexible nature of community prosecution forbids reducing the program to a fixed set of principles and steps that can be readily implemented elsewhere. To the degree that its success depends on bonds of trust between prosecutor and community, its success may hinge on the personality and talents of specific prosecutors. (Indeed, the article’s estimates show variation in the estimated impacts across offices within Chicago.) At minimum, the results demonstrate that, under circumstances that require more study, community prosecution can reduce crime. More broadly, the estimates suggest that the role of prosecutors is more far-reaching than typically thought. Crime control is conventionally understood to be primarily the responsibility of police. It was for this very reason that in the 1990s so much attention was devoted to the cities’ choice of policing style – community policing or order maintenance. Restructuring the work of police was thought to be a key mechanism through which crime could be reduced. By contrast, a conventional view of prosecutors is that their responsibilities pertain to the selection of cases, adjudication in the courtroom, and striking plea bargains. This article’s estimates show that this view is unduly narrow. Just as altering the structure and tasks of police may affect crime, so too can changing how prosecutors perform their work. Thomas J. Miles is the Clifton R. Musser Professor of Law & Economics and the Walter Mander Research Scholar at the University of Chicago Law School. He is also a faculty affiliate of the Crime Lab at the University of Chicago. His recent research has investigated topics in criminal justice and in judicial behavior. He is the author of “Does the “Community Prosecution” Strategy Reduce Crime? 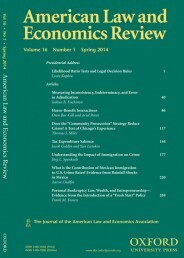 A Test of Chicago's Experience” in the American Law & Economics Review. He recently discussed this issue on NPR.